During the Second World War, Canadian and Allied merchant mariners faced the constant hard work of operating and maintaining their ships, the threat of enemy attack, and the dangers of accidents and storms. 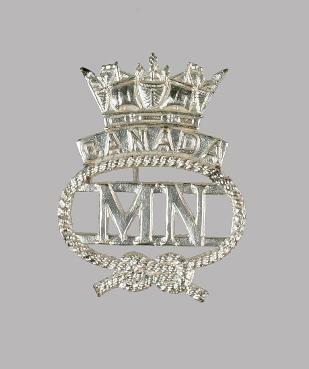 Somer Oscar James received this war service badge, bearing the initials "MN" for "merchant navy", for his service as a merchant mariner. James joined the merchant navy in 1941, sailing in 12 different ships before his war ended in August 1945. The Canadian government created the badge in 1941 to recognize the service of Canada's merchant mariners, most of whom wore civilian clothing ashore because they had no uniforms. In 1948, the Canadian government extended eligibility to Canadian merchant mariners who had served in Allied merchant ships.